Have you ever had something that you really didn't pay much attention to the first time you saw it, but then it kinda grew on you? That's what happened to me and those cute pompom or snowball garlands that are all over the place. The first time I noticed them was a year or so ago and they didn't exactly move mountains for me. But then I kept seeing them in different spaces and grew to love them. 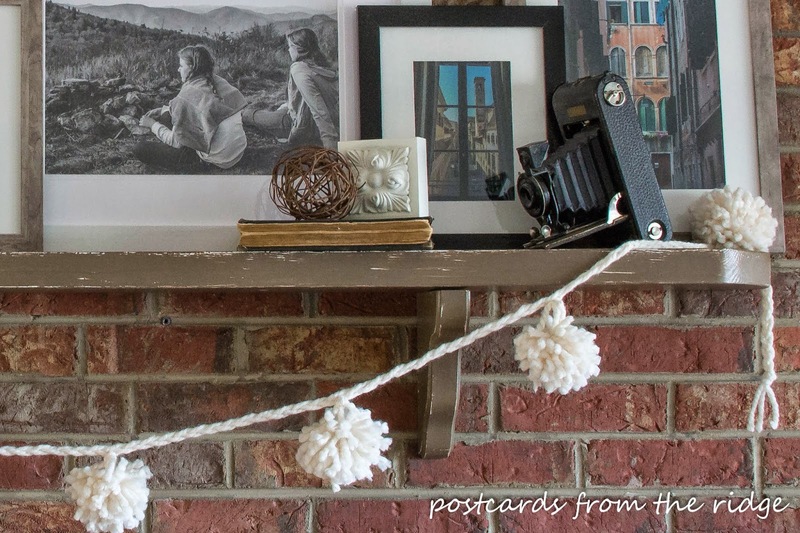 Today I'm sharing a tutorial for this pompom garland as part of an "Inspired by Pinterest" tour I'm participating in that includes some of my very talented blog friends and their pinterest-inspired projects. And today you're also getting a sneak peek at some photos that are going to be part of a gallery wall project that's currently in the works. There are a few more images to be printed and framed, and a couple of ledges need to be installed but hopefully it will be finished in a couple of weeks. Stay tuned for the completion and reveal of that project! After your done here, bebop down to the bottom of the page to see all of my friends' amazingly awesome projects and hop over to their sites to see how they did it. Click on the images to go to the posts. Since I'm not the world's craftiest chic, I keep my craft projects really simple. As in, you probably made these or something similar in Girl Scouts or VBS when you were a kid. It's that easy. 2 skeins of thick yarn - here's the one I used ==> chunky yarn. 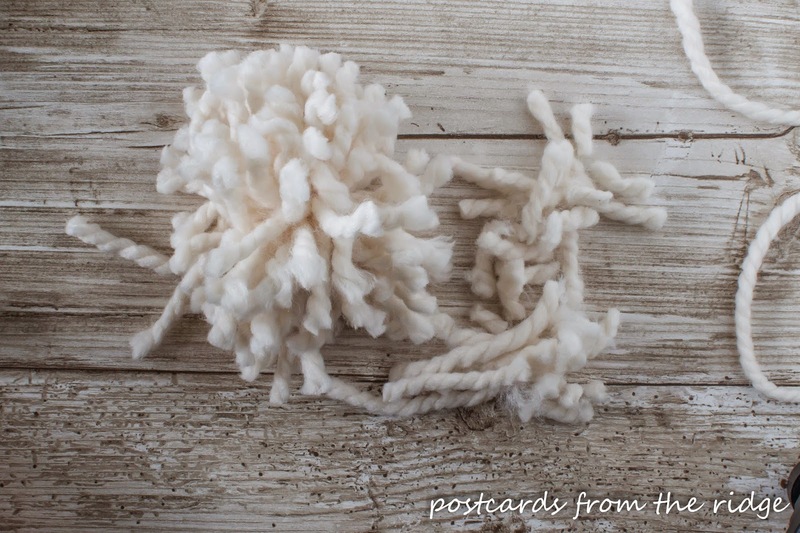 (affiliate link) I got 8 pompoms from one skein. And here's how to make this simple project. 1. 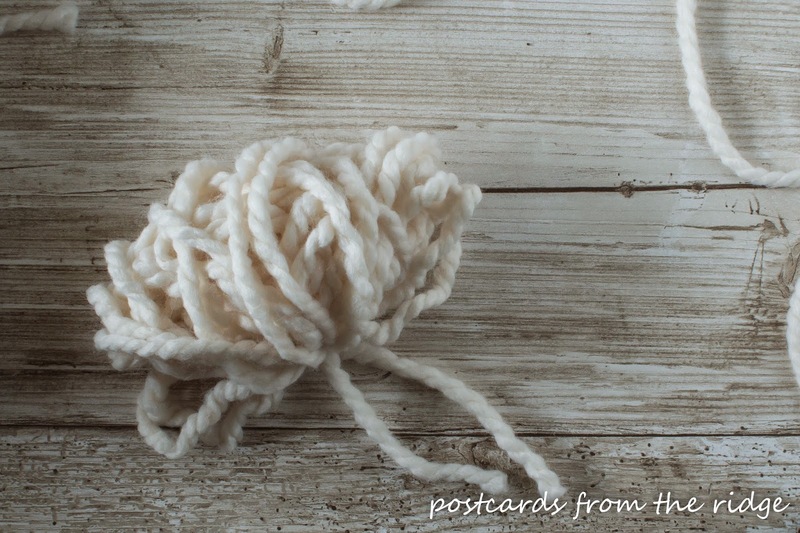 Start by cutting a piece of yarn about 9" and lay it in your hand. I secured one end between my fingers so it wouldn't slip. 2. 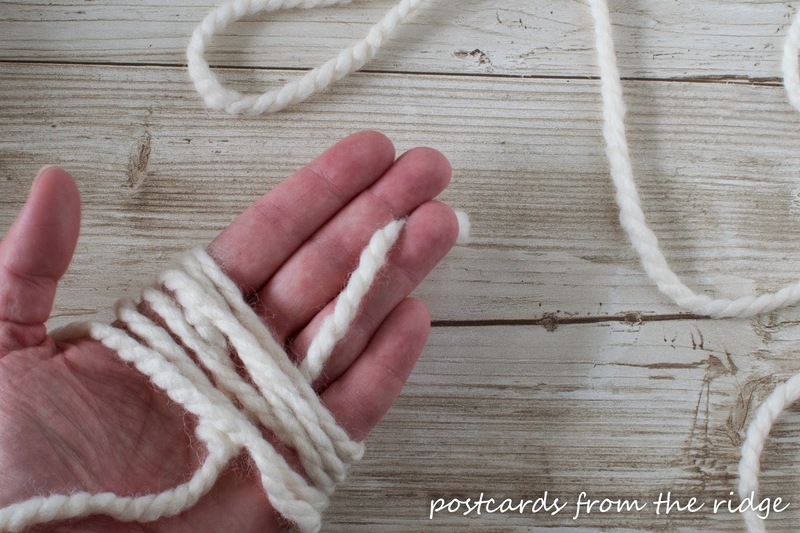 Wrap the yarn around the palm of your hand 50 times. You could do more for fuller pompoms. Easy so far, right? 3. Remember the short piece you laid on your hand? 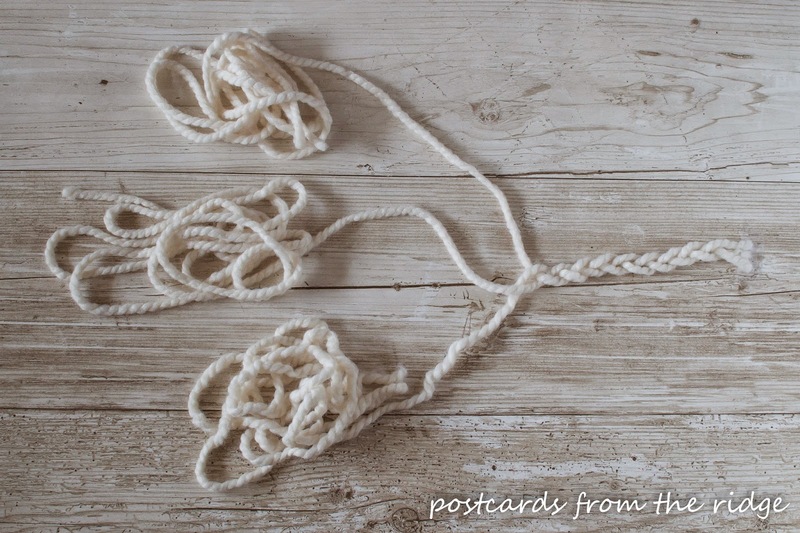 Take the ends of that piece and tie a knot one one side of the yarn you just wrapped around the palm of your hand. Keep track of these ends and don't trim them yet. 4. 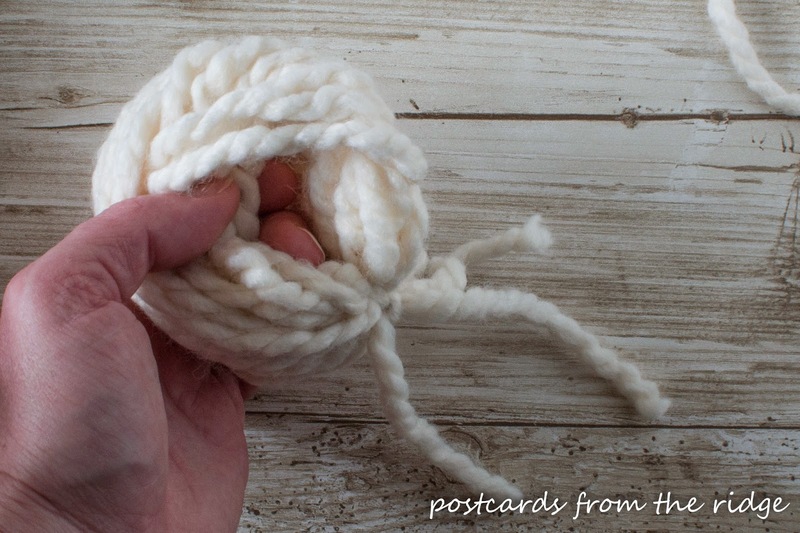 Find the center of the ring of yarn and hold it open slightly. 5. 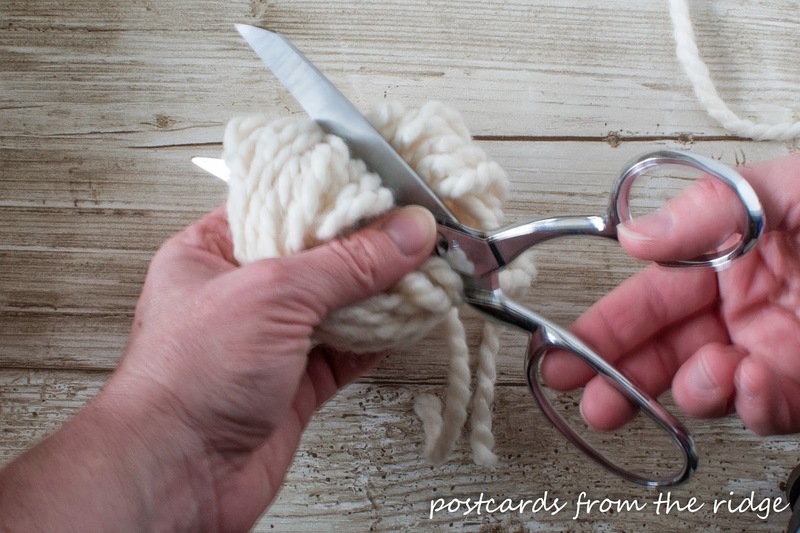 Using your sharp scissors, cut through the yarn ring on the opposite edge from the knot you tied with the short piece. 6. 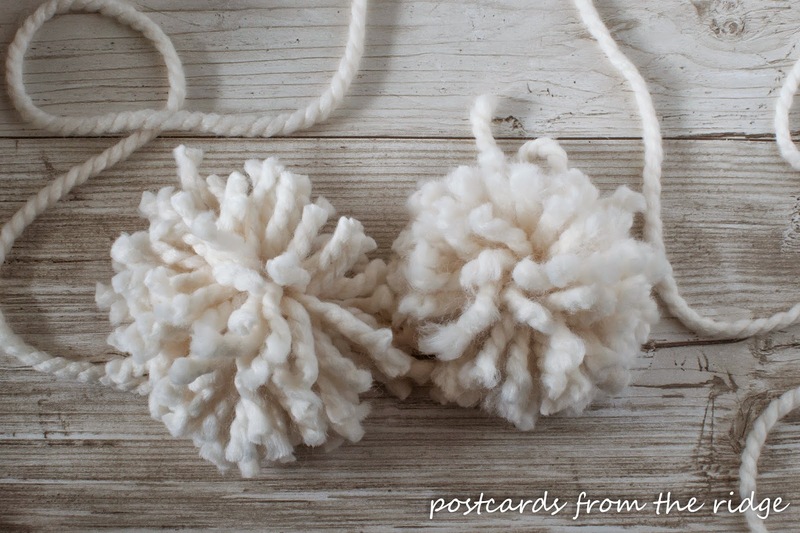 Next, trim the yarn pompoms so they're all the same length. 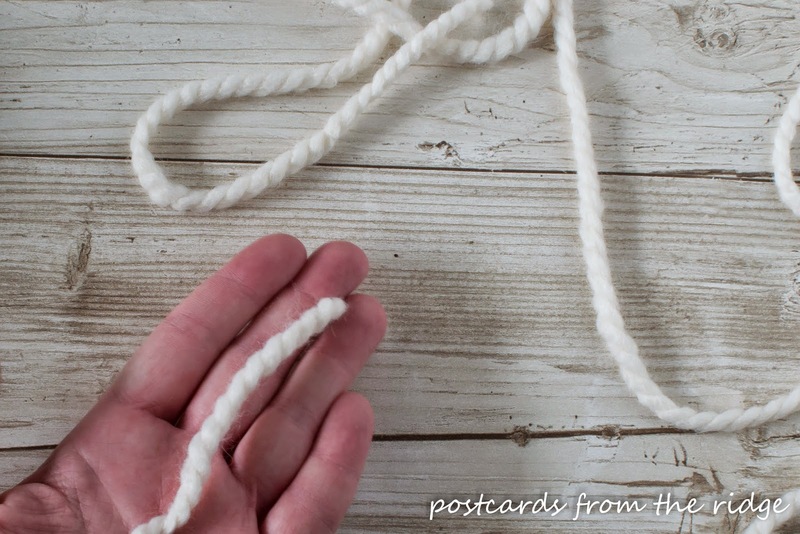 Don't trim off the ends from the knotted piece yet. Repeat until you have the amount of pompoms you want. 7. Now you'll want to fluff the yarn. 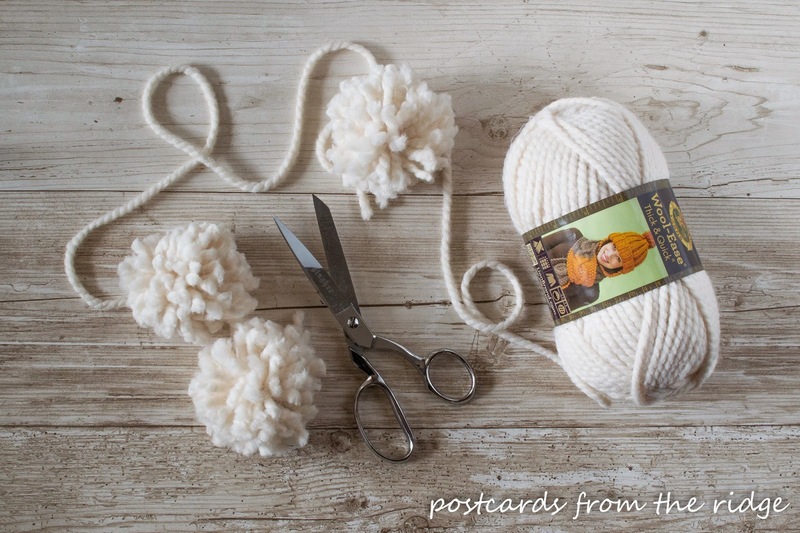 In the photo above, the right pompom has been "fluffed" and the left one hasn't. I like them fluffy. 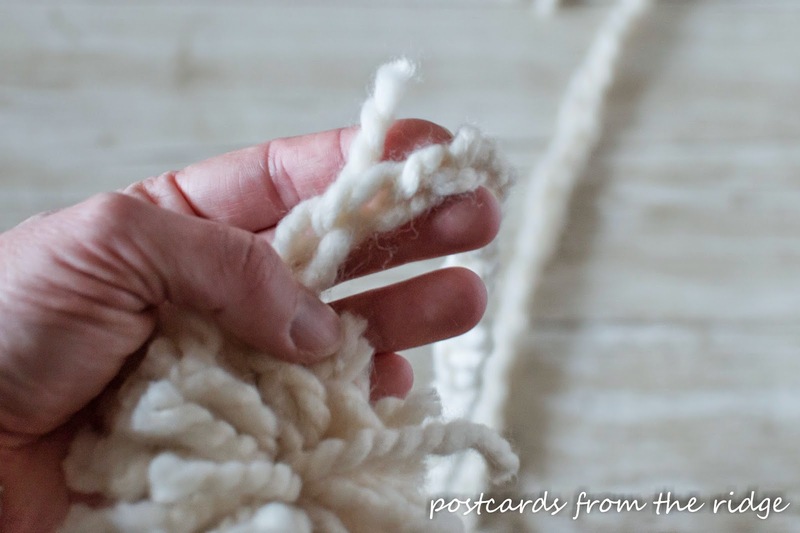 You can fluff them by simply rubbing the strands of yarn between your finger tips until they're the thickness you want. You could also use of wide tooth comb or a fork, but be careful not to pull out any strands. 8. At this point you can be done and tie them to a long single strand of thread, or you can make a thicker, braided strand to tie them on to. I wanted something thicker so I experimented a bit. The braid on the left was made with 6 strands, and the right one was made with 3 strands. I decided on the one with 3 strands. 9. 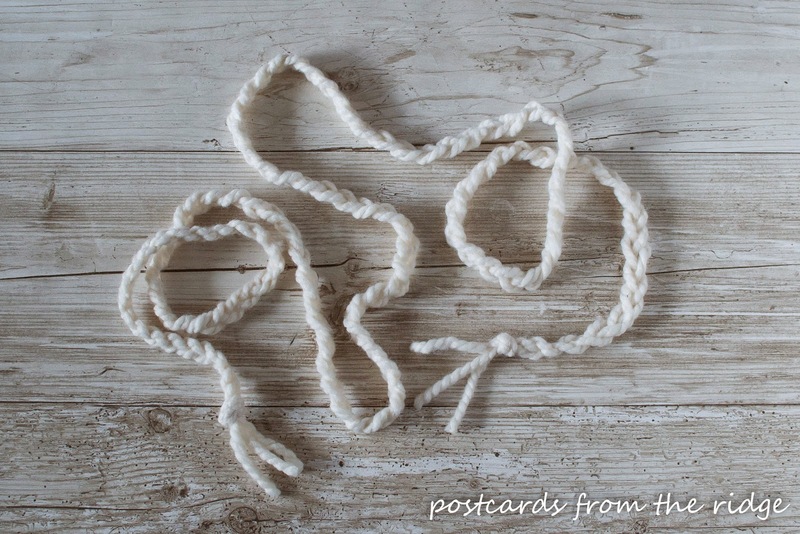 To make the braided strand, cut 3 strands of yarn (or 6 if you want it extra chunky) to the length you want. I cut mine to 8'. Next, tape one end to a solid surface and do a simple braid all the way to the end of the strands. Tie both ends off with a knot and trim the edges. It will look like the photo below when you're finished. 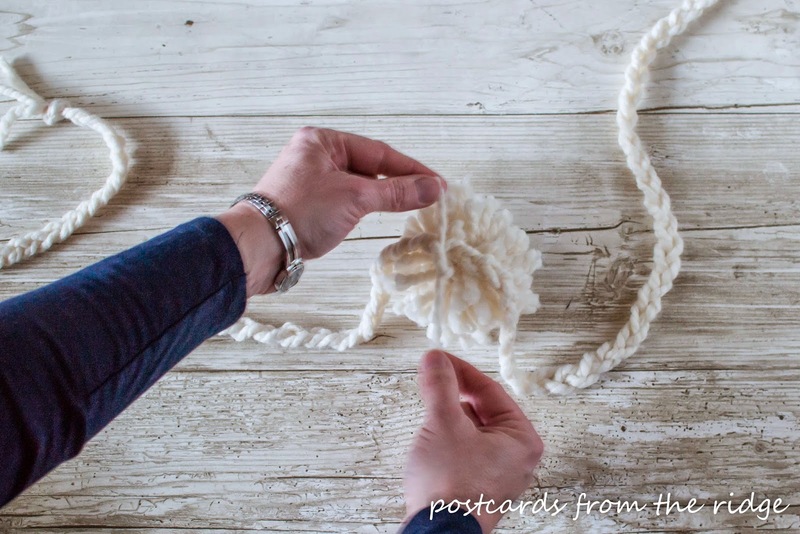 10.Now decide the spacing of your pompoms and tie them on to the braided strand. 11. Remember those ends I told you not to trim yet? 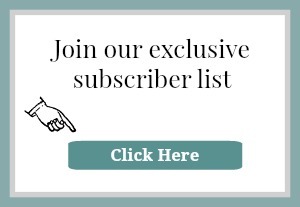 Here's where you need them. 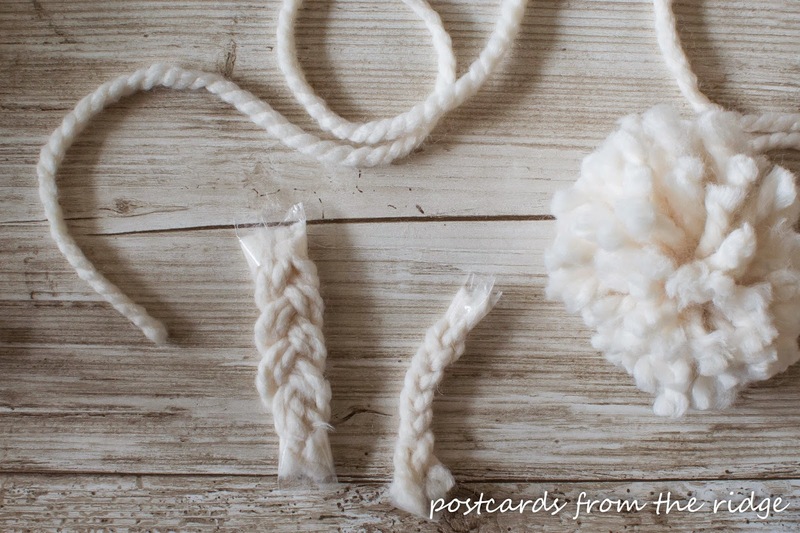 Run one end through the braided strand and tie on the pompom with a knot. Repeat until all the pompoms are attached. You're done! Now all you have to do is hang it up. How's that for simple, even though it does take an hour or so? 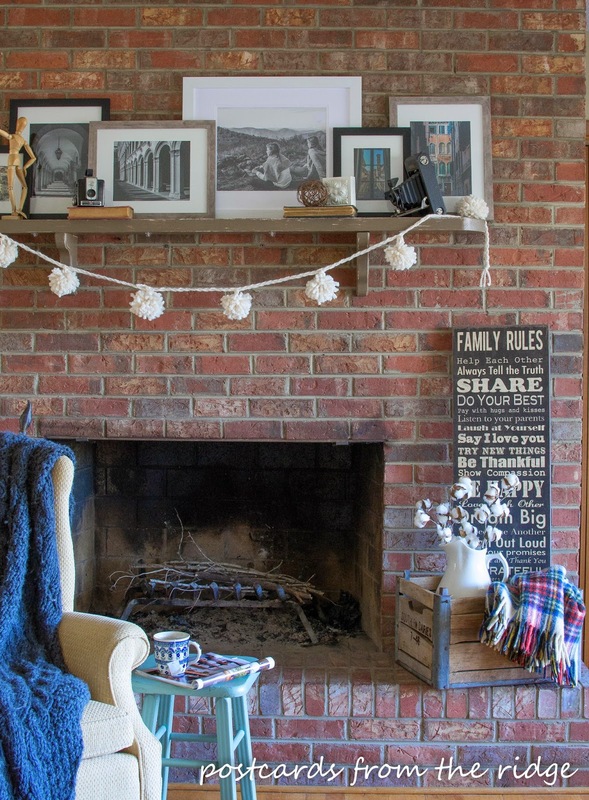 Our living room fireplace mantel is too skimpy for my taste so I hung my pompom garland here to fill in some of the empty space. 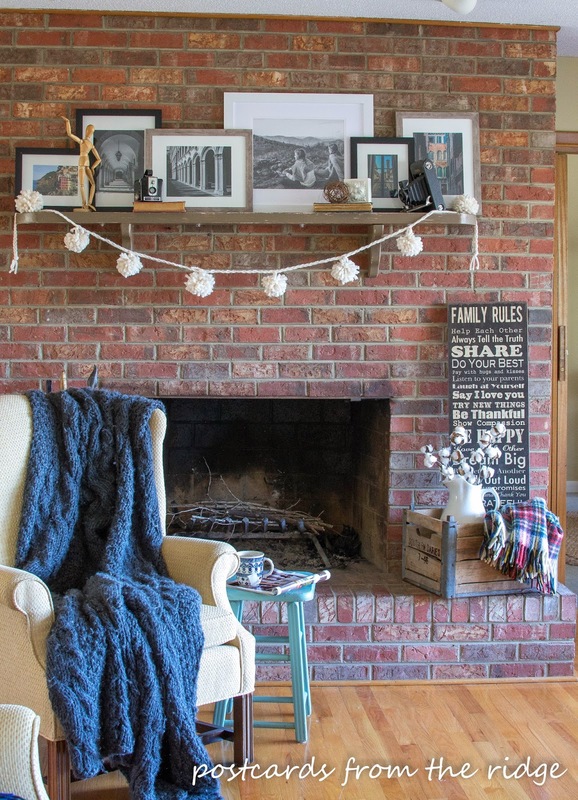 Building a chunkier mantel is on my to-do list for this space. That and 500 other things. 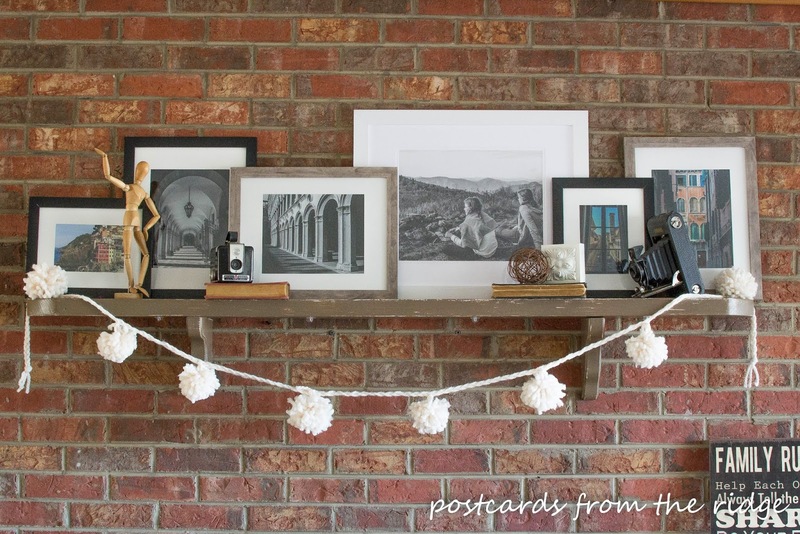 Let me know if you decide to make one of these fun garlands. I'd love to know how you decide to use it too. 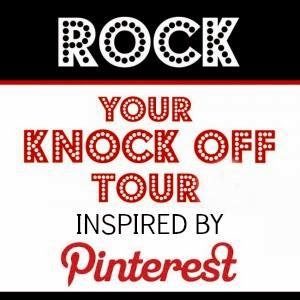 Don't forget to keep scrolling down to see many more pinterest inspired projects from my uber talented blog friends! Thanks Vanessa! It was so easy to make! I love this so much! I made pom poms two years ago but never did anything with them,now I'm inspired, you did a beautiful job! Thanks, Dria! It's such an easy project! You could do it in no time! Love these! That junky yard is perfect, thanks for the tutorial! Thanks, Debbie! I love the chunky yarn. Such an easy project! 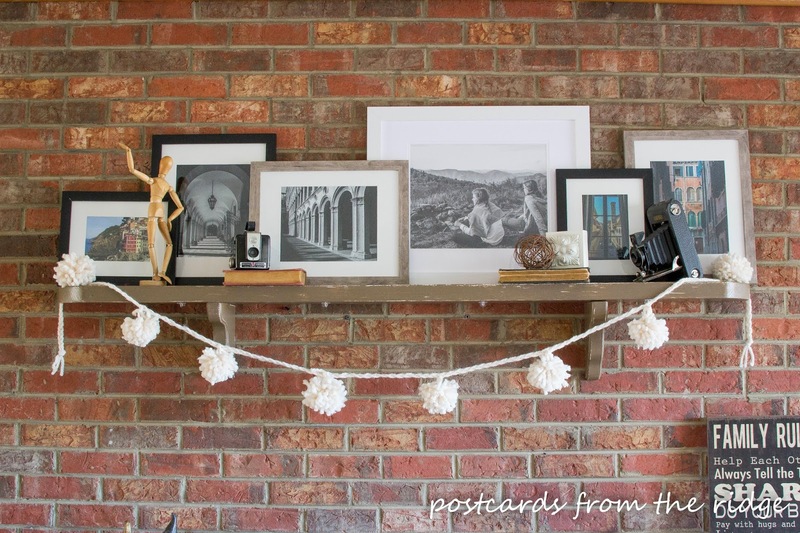 What a fun way to dress up your mantel for winter. Mine is still bare after taking Christmas down! I look forward to seeing the gallery wall that you are working on. I love pom poms! 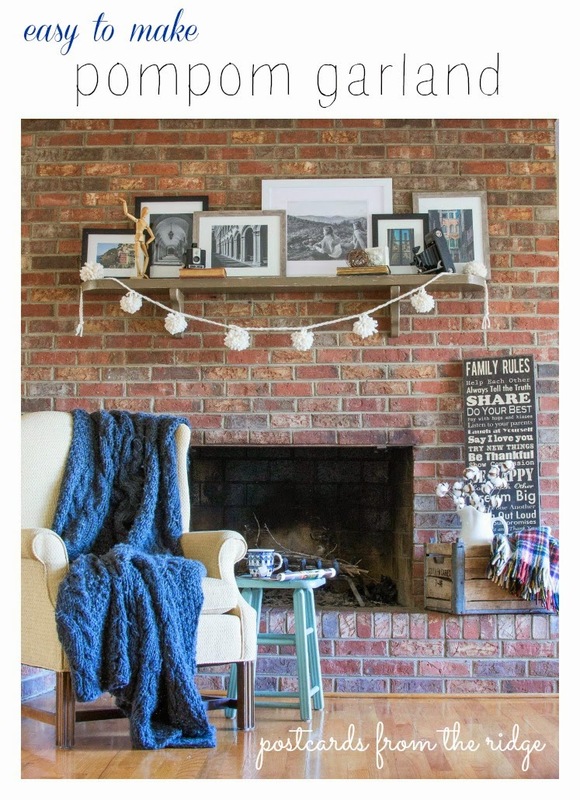 The chunkiness of the yarn makes this garland extra cool! Thanks, Jeanette. I love the chunkiness of it! This is a perfect interpretation of Anthro....so much more rewarding when you DIY it. Awesome! Angie I love your chunky pompoms! ;) It turned out beautiful and really softens up your mantel area. 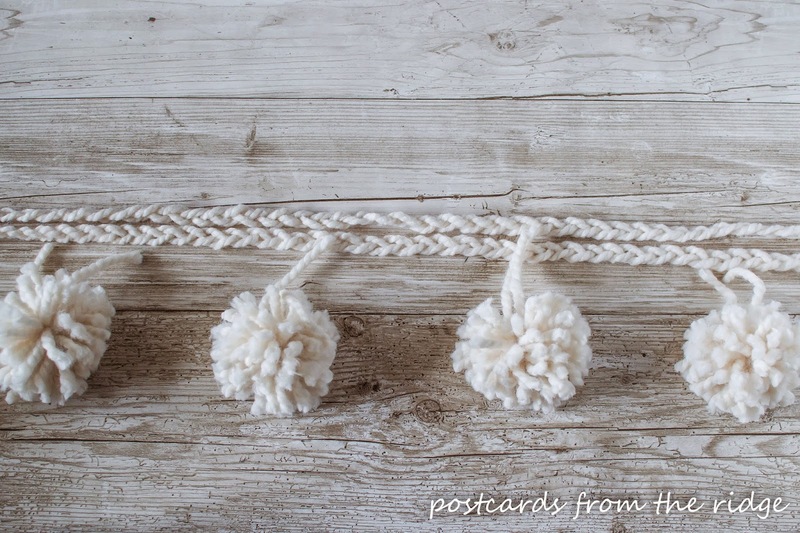 Love your pom pom garland...I made two garlands and a wreath this month...it's a fun little project.